why use ISO 1600 in this Canon 5D street shot? Mike Johnston at the terrific The Online Photographer blog notes today the release of a new Zeiss Distagon 21mm f/2.8 lens for Canon, and he links to a gallery of photos at Flickr taken with the new lens (and a Canon 5D). Nice photos, obviously a nice lens. Here's a link to the photo in situ. The photographer's Flickr handle is "silver2silicon". Me, I prefer names, but what can you do. Just in case the links break in the future, let me describe the photo. The photographer is apparently standing inside a parking garage, looking out through the entrance/exit driveway toward the street. It's shady inside the garage, but out on the other side of the steet in the distance maybe 75 ft, there's early morning or late afternoon sunlight just grazing the front of the buildings. There's only one human in the shot and you don't notice unless you look hard: he's walking on the sidewalk in the distance, outside the garage and on the other side of the street. 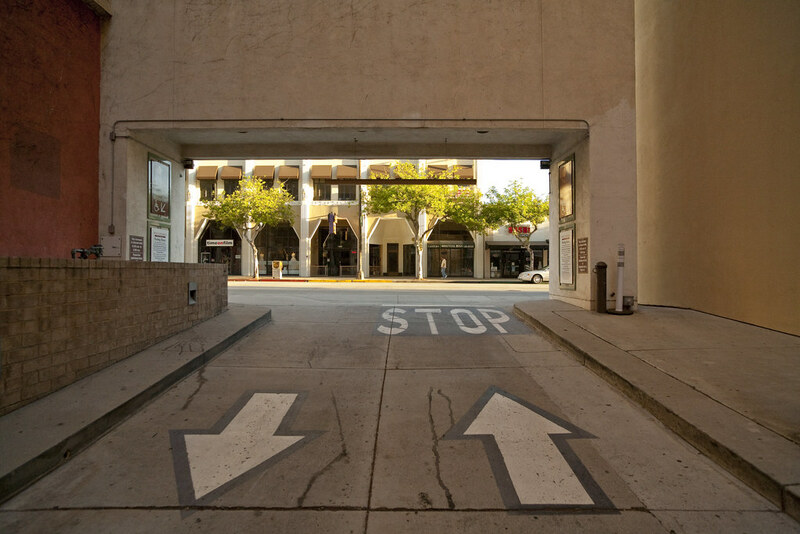 Otherwise, the shot is mainly of the garage's exit/entrance, with big arrows prescribing the flow of traffic. Anyway, according to the info beneath the photo, this photo of a parking garage was taking at ISO 1600 and a shutter speed of 1/640th sec! Is this rational? Why would the photographer take a photo like this at such a high ISO? I know the Canon 5D doesn't have shake reduction, but this is a 21mm lens so the shutter doesn't have to be very fast to offset a little unsteadiness in the hands. I would have used ISO 800 and 1/300th sec - perhaps even ISO 400 and 1/150th sec. I should add that I have no idea whether the photographer was using a tripod but it seems possible. Most of the photos in this gallery are what you might describe as architectural shots, without people, and I would not be surprised if a 5D shooter with a Zeiss lens was carrying a tripod around. And if he had the camera on a tripod, then I find the high ISO/fast shutter even more mysterious. Is there a good reason for this choice of settings? Am I missing something? Maybe he just likes the look? I often shoot my 1DsII at ISO 800 just because there's a certain look and feel to the files that I like -- just that hint of grain/noise on a print that makes it pleasant looking. A possibility comes to mind... Perhaps his purpose was other than this shot - maybe he was set up to photograph some cars entering or exiting the garage, and during a lull, he framed and snapped this, and liked it. I do this sort of thing all the time though the lack of deliberate preparation seldom results in keepers . Also, if he was going to do a B&W conversion and use something like SilverEFX, the noise gives that software something to work with. But actually iso1600 is pretty damn clean, at least on the 5D2, so the answer may be that he used 1600 because it didn't make much difference from a noise perspective relative to iso 400. True, if he wasn't using auto ISO he could have left it at 1600 just to have enough sensitivity to keep the shutter speeds up at various apertures and light levels. I don't have an answer but I am impressed with the exposure and how the street was not over exposed and the garage was not under exposed. Nice work. I agree, the shot is pretty noise free, as far as I can tell on Flickr and perhaps he didn't change just because he didn't feel the need. Sometimes I have great luck with ISO 1600 on my K20D - I have taken shots that I think are about as clean as this shot - but I don't push my luck as a rule. OH, well, I thought it was interesting and thanks for the replies. I clicked on the flickr link and my guess was confirmed. I'm fairly certain that the user simply forgot that he was in ISO1600, didn't notice or simply didn't care to change it, since the entire set seemed to be shot in ISO1600. Anyhow, I wouldn't get too boggled by the details - yes it would've been a bit cleaner at lower ISO, but I think you will find that people's tolerance for high ISO is highly subjective! To my eye the 5D2 is about two stops "cleaner" than the K20d. I would shoot the K20d at 1600 and it was "ok" but it depended on the details. I have a bunch of candid portraits that I shot at 1600 and wish they were at 800. With the 5D2 I shoot 3200 without any hesitation. 6400 is "ok" and often I would prefer to be at 3200. I've spent a little time with the 5D and there might be a few reason, several of which were already mentioned (he forgot, noise for BW conversions, etc.). I do know that some 5D2 users actually like the look of the 5D file a lot better (they're more film like). One reason (also mentioned above) is that the camera really handles noise well....enough that you almost don't know what ISO you're at. In fact, there's no display to tell you without hitting the 'Info' button (I hate that btw). My guess is that he either forgot or didn't care. Maybe he wanted to recover the highlights of the sky and buildings outside? Shooting low iso in that situation they'd be blown. Shooting high iso exposing for the interior you have a lot of leeway to pull back the hightligths. I think that's what he did. That's what I do in scenes like that which require huge dynamic range. Thanks. This is just the kind of answer I was looking for. Not sure I understand it completely - I don't use 1600 in this way. But I'll make some tests and see what I find out. Thanks. My guess is he was using a flash bounced on a back wall or high ceiling on low enough power that it didn't create shadows. To compensate for the low power, he had to have higher sensitivity. I don't understand. Low iso gives you more dynamic range. I wonder if, as with film, the higher the ISO/ASA the greater the lattitude. It is something I have never considered with my digital camera. Now I shall have to go out and experiment to see if that is the case. This photo seems to show exceptional lattitude. All times are GMT -7. The time now is 03:16 AM. | See also: NikonForums.com, CanonForums.com part of our network of photo forums!